Jabba Line Art Boxes: Legit or Custom? 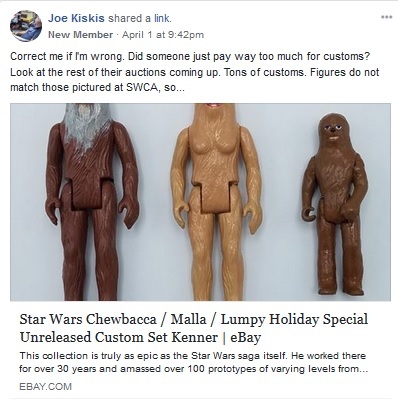 What starts out as a collector in the Echo Base group warning the community about the fact he was scammed on a line art Jabba the Hutt set, quickly turns into a thread about whether or not ALL line art Jabba the Hutt sets are a scam. Legend has it that they are either a department store catalog variation or were created by a collector in the 1990s using factory overstock. The community debates the issue. 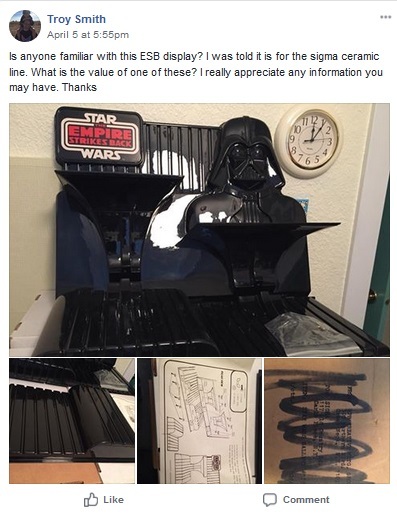 Line Art Jabba boxes: Did stores really use them? 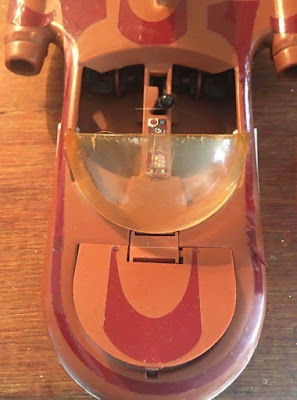 As a cost and time saving measure, toy companies including Kenner would reuse older toy designs and toy molds on new lines with added modifications. 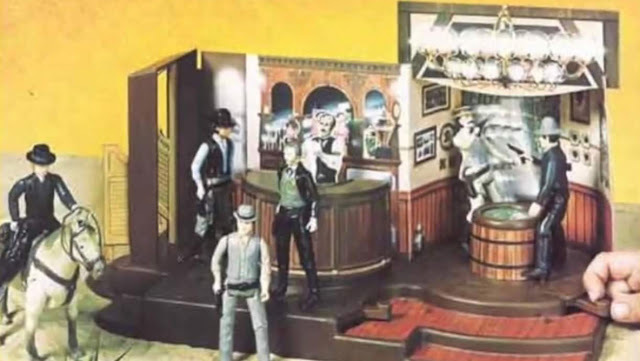 Kenner reused the molds from their Creature Cantina action playset to produce their Real West Cafe playset as part of their Butch Cassidy and the Sundance Kid line. The familiar similar features of the toys make for an interesting comparison in this thread from the Imperial Commissary. If you've been following the Star Wars Community Digest, you know that we are entirely against unmarked customs of actual prototypes. They can confuse buyers. 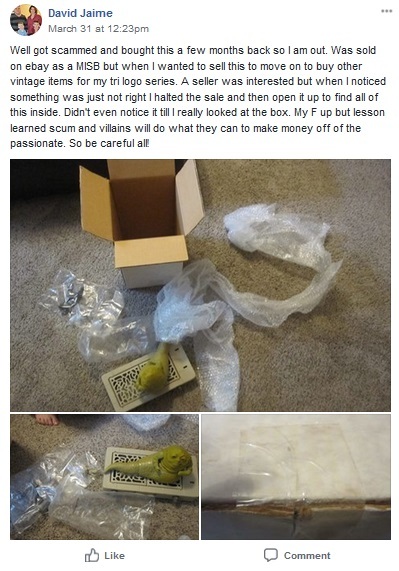 Such is (in our opinion) the case with a recent series of auctions on eBay. 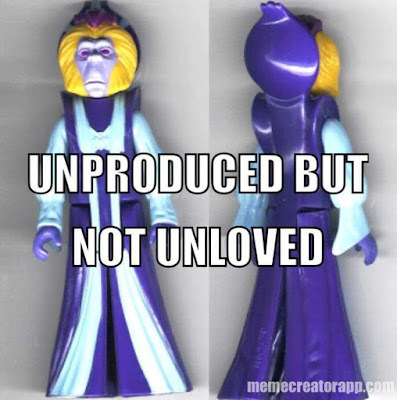 All of them are advertised as customs in the auction title, but then the description includes such misleading details as "All prototypes in this auction are actually figures [the Kenner designer] himself designed and engineered or hand painted." But the figures being auctioned off aren't prototypes. At all. To be clear: these are toys created in the modern era, allegedly by an ex-employee. Whether that is actually the case or not, it still doesn't justify the HUGE ending price. Generally speaking, no one pays $2,100 for three custom figures, unless they're confused by the misleading item description and assume they are genuine prototypes. Or maybe they just have a TON of money to waste on loose toys that someone has recently played arts and crafts with. Either way, auctions like these would be a lot clearer if the artist had marked them as reproductions in some way. Then, the people who were interested in owning them would know what they were buying, and no one would lose money because of vague and misleading descriptions. The community also identifies other problems with this series of auctions, from accusations of shill bidding to reports of fake autographs being peddled by the same seller. In 1980-1981, Sears stores throughout Canada offered multipacks of carded figures which each included an early release of one of 7 new figures for The Empire Strikes Back. These figures were released prior to the production of the individual cardback art and figure bubbles. The figures were released on black cards with the figures skin-wrapped to the cardback. Way back in our first issue of Star Wars Community Digest we detailed a find of POTF coins, which had some troubling abnormalities about them. 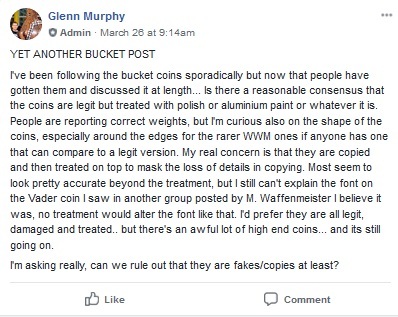 As time has gone on, the community has debated whether or not the coins were genuine or fakes. Last week, the POTF Coin group returned to the issue to see what the consensus was. 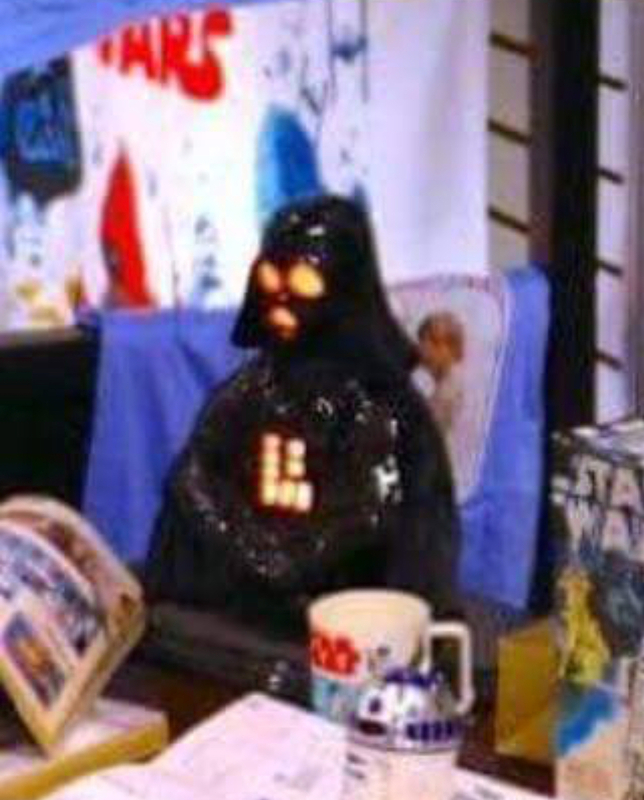 Follow the conversation as it delves into the variety and the origins of early bootleg ceramic lamps in this thread from the Star Wars 12-Backs group. 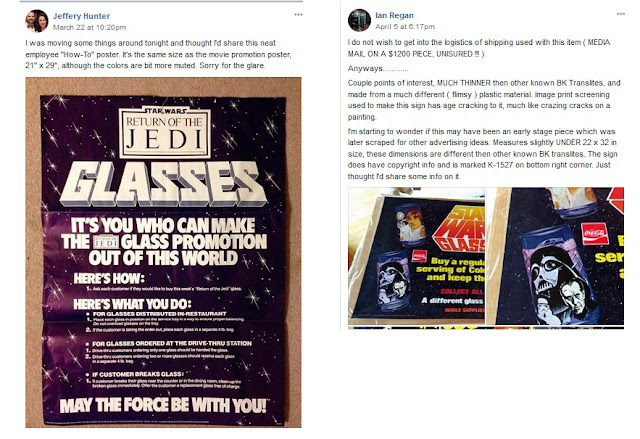 A collector asks the Star Wars Store Displays and Advertising group for information on this interesting store display. As it turns out, it's an awesome shelving display used to sell the vintage ceramics released by the Sigma company. The unproduced second wave of Droids and Ewoks figures which were proposed in 1985 were never released as the entire Kenner Star Wars toy line was canceled. These figures still exist in single digit numbers in variable pre-production stages acquired from Kenner employees. 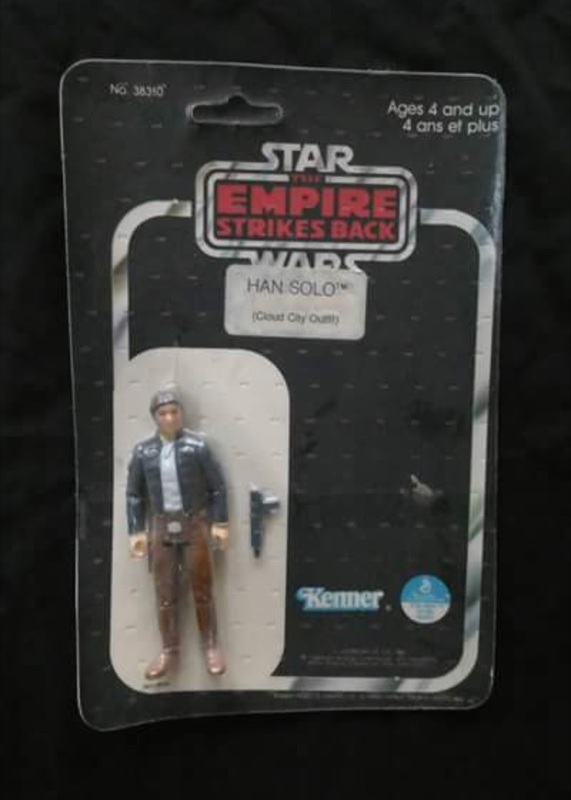 The continued allure of these figures remains strong for many collectors and is discussed in this thread from the Empire Strikes Back group. A rare Landspeeder variant from Australia is found in Canada. Follow how Australian vehicles migrated to North American retailers in 1978 in this thread from the Imperial Commissary. Promotional displays for the vintage Burger King glasses were all over the Displays group last week, and they were all awesome! While the glasses themselves are semi-ubiquitous, the displays are always a real treat to see, particularly when they're as rare as these examples are! In late 1982, Lucasfilm sent its representatives to the LosCon sci-fi convention to promote Return of the Jedi, which would be released the following year. ARPANET user "RAND@sri-unix" returned from the convention, signed into the net.sf-lovers newsgroup (it's like a discussion forum mixed with email, only from waaaaaay back in the day), and shared his thoughts on the event and the shocking information he was able to garner from it. For instance, as it turns out, LFL confirmed that Obi-Wan was a ghost in ROTJ (or as the representative is quoted as saying: "He's still dead, or in heaven or wherever Jedi go when they die"). Other interesting tidbits is the first announcement of Mon Mothma to the Star Wars fandom... despite the fact that someone was reportedly already at the convention cosplaying Mon Mothma. Which is really weird. And also impressive. 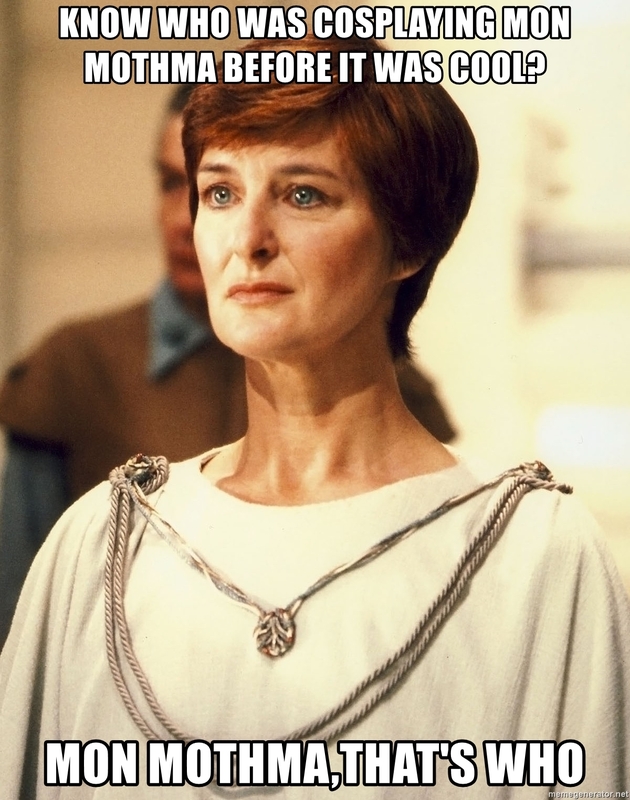 I can only assume it was the character herself, searching for more Bothans to ruthlessly sacrifice for the greater good. In any event, if you're interested in the early days of the Star Wars fandom or the history of sci-fi conventions in general, this is an interesting thread.